April 2012: The Longest, Quickest, Most Stressful, and Most Exciting Month EVERRRR. It seems as if this past month has been one of the weirdest months in my life. All at the same time this month is what I mentioned it was on the topic. The Longest, Quickest, Most Stressful, and Most Exciting Month EVERRRR. With Seattle Weekly’s Voracious Tasting, 100+ Reservations for Brunch at the Harvest Vine, and the busy two weeks of Seattle Time’s Restaurant Week, it has been an eventful month. But ever since I found out I was a one of the to 30 finalist for the Basque Stage, I knew that it was going to be a very ‘different’ month. But I knew, what ever the outcome, I will take away so much from this opportunity because I already have such a feeling of accomplishment that I now know what I am truly capable of. All I know that is I have grown these past weeks. From my attitude at work to my everyday life, I feel as if taking part of this Basque Stage has really made me want to better myself at everything I do more-so then before. I was already a hard worker, but I have found a new sense of confidence because of how far I have come. From all of the tasks I have had to do for the application process for the Basque Stage, I have learned so much about myself. I knew that I am a very determined and passionate at everything I do, but I tend to forget that there is no limit to these things. We will all face opportunities when we strive at a limit that we have never seen before and I feel like I am on Cloud 9. I felt like I have put my heart and soul into my Basque Stage Candidate Video, Food Blog Candidate Post, and my Essay (which I will post maybe… unless you all would want to read it.) And not just these things, but also into this blog. I think this blog is the biggest surprise of this past month. I have now found such an interest in writing in this thing and am so glad I started it. I have a lot to share and hope that people out there are appreciative of the things I write about because I’m writing for you guys. I plan on continue writing no matter the outcome of the Basque Stage because it’ll be a nice reference for my future self to see how far I have came. I’d like to thank all of you guys who have invested your time on myself and what is currently happening in my life. It’s such an exciting time for me and all of the support is so amazing. So where do I stand now? I stand in this state of Nostalgia. I find myself recollecting on my Basque Stage Application and thinking that I could have done more. I should have done more. This is a weird feeling because I feel like I’ve already done the best I could do and just hope that its enough. But thats the way I am. Its the way I work. Enough is never good enough, I strive for the best. All I can do now is just is patiently wait the next week and just wish for the best…. 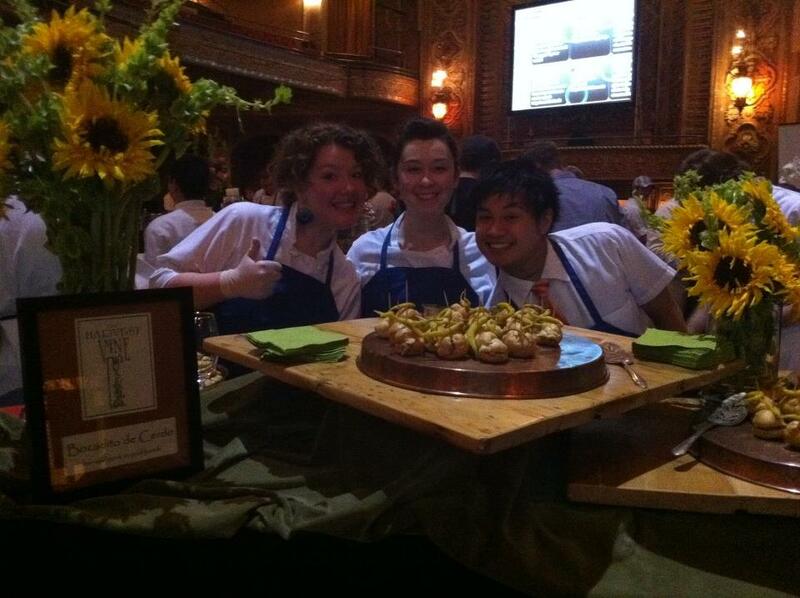 I had the great opportunity to take part of Seattle Weekly’s Voracious event that takes place at the Paramount. It was my second year of representing The Harvest Vine and I got to say that this is probably one of the events that I am most excited to participate in all year. The great thing about Voracious is the energy of the whole thing. I strive for events like this. It has all the componants for a great day. Great food. Tasty drinks. Music. And most of all, very happy people! 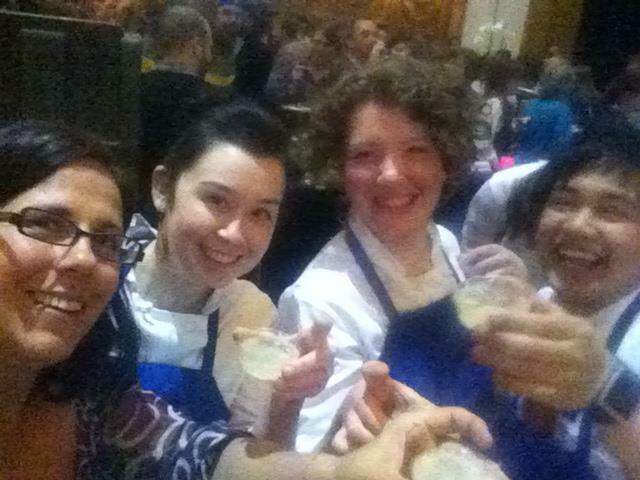 The Harvest Vine Voracious Crew! 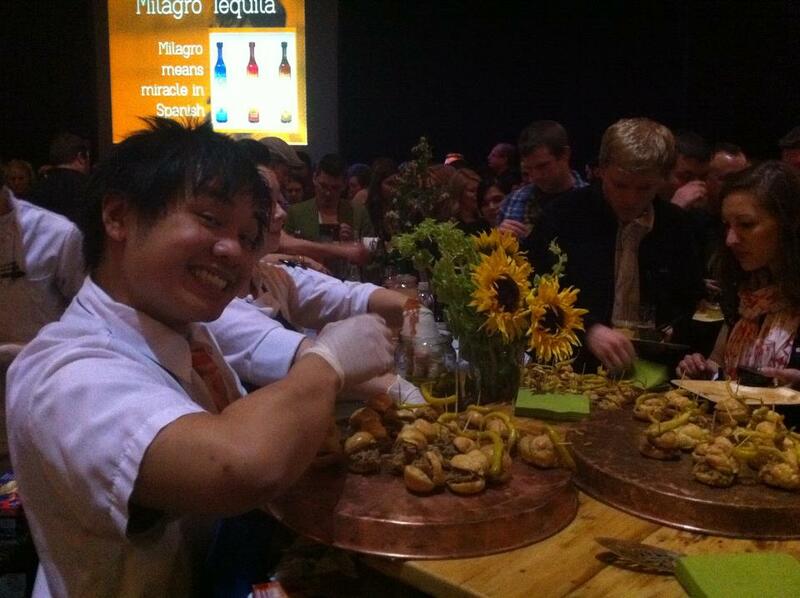 It is such a great event solely for the fact that there are so many different restaurants and bars participating. Its definitely a great way to network within our community and also just to meet new faces. Me modeling some Bocaditos de Cerdo. Pulled Pork in Profiterols with Pipparra Peppers. The little bite that we had contribute to the event was a Bocadito de Cerdo. A bocadillo, or in this case, a bocadito, is a small sandwich in Spain. Our vessel was a profiterol for the perfect little bite. The filling was Moruno marinated pork. Its a very flavorful, 6 hour braised pork shoulder (even though its traditionally pork loin) that is packed with the smoky flavors of Spanish paprika, better known as pimenton. It was then skewered with a pickled pepper called a pipparra. It is not a spicy pepper, but has an acidic kick to really balance the flavors of the sandwich. Mini Sandwich production well underway! Look at all those hungry people! 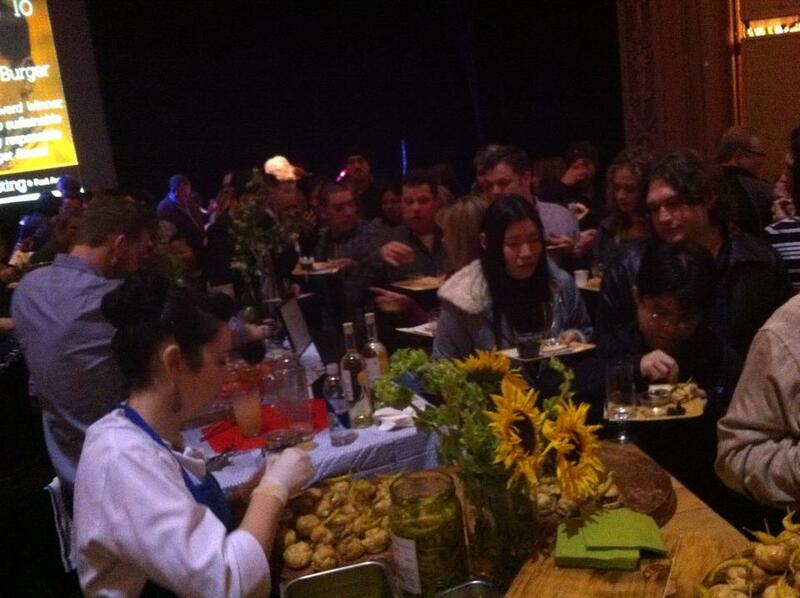 My favorite part of the night was being able to share with the audience the food we prepare. I was very excited to tell people about Spanish food and show my love and excitement for this cuisine. There aren’t a lot of Spanish restaurants around Seattle, so I love that we had the opportunity to not just show the flavors of Spain, but also bring some Spanish culture to the people of Seattle. Overall, Voracious was was such a success for all that participated as we all ran out of our tasty treats by the end of the night. The energy and the feeling of excitement in the venue was outrageous and I loved every second of it. Sad that it’ll be another year until the next one, but I’m sure there will be a lot of very exciting things to keep me occupied until then!